Harvard University Press, 9780674072763, 670pp. It's the American dream--unfettered freedom to follow our ambitions, to forge our identities, to become self-made. But what if our culture of limitless self-fulfillment is actually making millions desperately ill? One of our leading interpreters of modernity and nationalism, Liah Greenfeld argues that we have overlooked the connection between egalitarian society and mental illness. Intellectually fearless, encompassing philosophy, psychology, and history, Mind, Modernity, Madness challenges the most cherished assumptions about the blessings of living in a land of the free. Modern nationalism, says Greenfeld, rests on bedrock principles of popular sovereignty, equality, and secularism. Citizens of the twenty-first century enjoy unprecedented freedom to become the authors of their personal destinies. Empowering as this is, it also places them under enormous psychic strain. They must constantly appraise their identities, manage their desires, and calibrate their place within society. For vulnerable individuals, this pressure is too much. Training her analytic eye on extensive case histories in manic depression and schizophrenia, Greenfeld contends that these illnesses are dysfunctions of selfhood caused by society's overburdening demands for self-realization. In her rigorous diagnosis, madness is a culturally constituted malady. 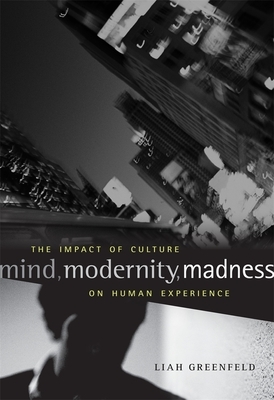 The culminating volume of Greenfeld's nationalism trilogy, Mind, Modernity, Madness is a tour de force in the classic tradition of mile Durkheim--and a bold foray into uncharted territory. Often counter-intuitive, always illuminating, Mind, Modernity, Madness presents a many-sided view of humanity, one that enriches our deepest understanding of who we are and what we aspire to be.